I’m a bit funny when it comes to eggs. I cannot stand runny yolks, they just make me gag and I don’t like runny whites. Everyone is different and everyone likes their eggs cooked differently. I like my eggs firm and for that reason I keep them over the heat a bit longer then allow them to sit in the pan for a couple of minutes and the residual heat continues to cook the eggs. If you prefer runnier eggs then cook them over the heat a little less and remove from the pan straight away. Place a small frying pan over a low – medium heat and add the oil. Add the tomatoes and after cooking them for 1-2mins add the spinach. Don’t be alarmed if you think there is too much spinach, it will wilt down, just keep stirring every so often. Whilst the spinach is wilting, break the eggs into a bowl and whisk. 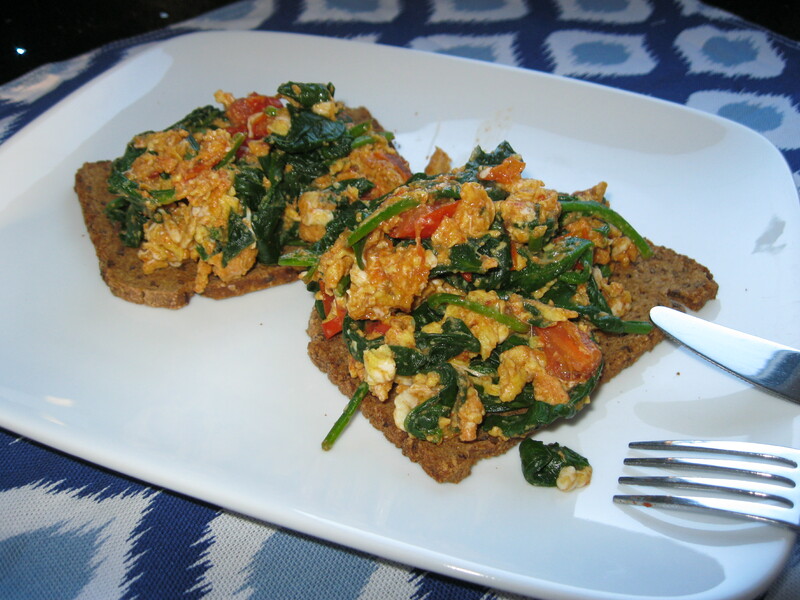 Once the spinach is wilted, add the eggs to the pan and give a quick stir. Add the paprika and stir to incorporate. Once the eggs start ‘scrambling’ remove from heat and keep stirring until desired consistency. 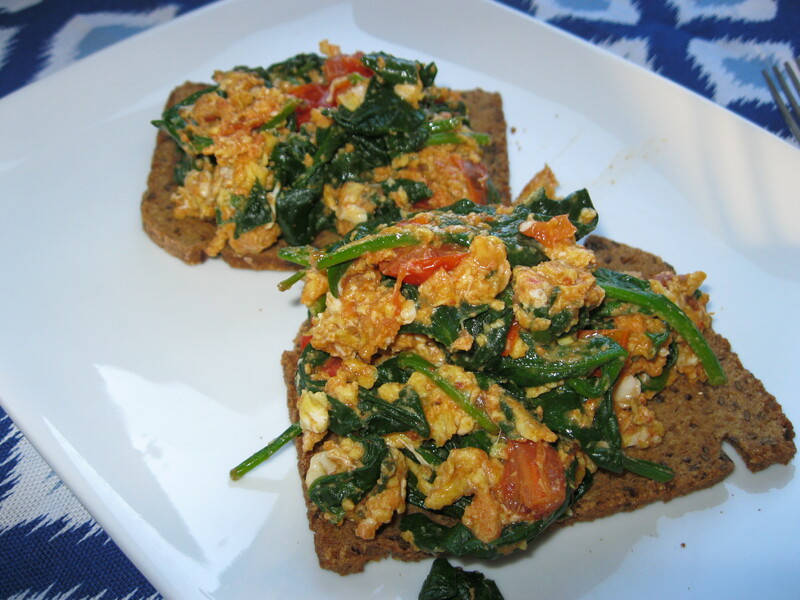 I served my scramble on toasted millet bread but you could serve with any bread or as a side with bacon or sausages. I say the same thing every time I try to take a photo! I am terrible at getting good photos of my food an worry they put people off. You needn’t worry, I think that looks delicious! Thank you! It is so difficult trying to get a decent food shot, especially when my camera is on it’s last legs!